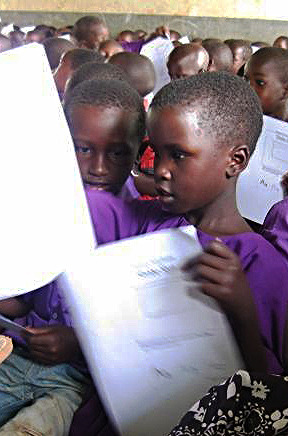 The USAID/Uganda School Health and Reading Program, created to improve educational quality, is funded by the United States Agency for International Development (USAID) and being implemented by RTI International in collaboration with SIL LEAD, World Education, VSO International, Africa Development Corps, International Book Bank, Books for Africa, and the Centre for Social Research. This 5-year project is being implemented to support Uganda’s Ministry of Education and Sports (MoES) to improve the quality of education in Uganda emphasizing early grade reading, and HIV and AIDS education. Working to strengthen the government system and build staff capacity, the project will emphasize hands-on leadership at national, district, and school levels to address Uganda’s challenges of low literacy levels and high HIV prevalence. SIL LEAD’s responsibility to the program is to bridge language barriers and improve reading, learning, and instruction in African languages selected by the MoES. Pursuing initiatives that address both quality of education and access to health information, USAID/School Health and Reading Program aims to improve both early grade reading and the health behavior choices of young students. Direct program outcomes include improved reading skills of 1 million primary school students and sustainable systems for the country to better monitor and respond to the evolving prevention needs of the HIV and AIDS epidemic in Uganda. Training and professional development of teachers, better learning materials, and improved tracking of students’ progress will increase the quality and relevance of education. It will also improve the effectiveness and efficiency in the delivery of education services. SIL LEAD is providing technical assistance by engaging with speech communities to standardize their writing systems and develop mother tongue reading and instructional materials for Primary 1-4 classrooms. Working collaboratively with project partners, SIL LEAD will also support the development of a sound pedagogical approach to transition 4th grade students to English as the language of instruction. As of February 2014, student books and teachers’ guides have been published in eight languages and are being implemented in Primary 1 classrooms. In addition, Primary 2 materials for four languages are being published now and will be in schools by April 2014. Ugandans speak at least one of 40+ local languages yet most schools teach in English. Many of these languages do not have a standardized writing system (also called orthography). One of the first objectives for the USAID/School Health and Reading Program was to identify the language and districts in which the project would be implemented. In 2012, SIL LEAD conducted an initial assessment of existing orthographies of several languages using an orthography analysis tool developed specifically for use in the Ugandan context. With the help of this tool and in collaboration with RTI Reading Specialists, the MoES chose which languages would take part in initial implementation of the program and identified which languages would need greater support. In 2013, SIL LEAD assisted in the development of materials for teaching reading. Creating reading materials involves conducting orthography review workshops with language communities to determine what changes might be necessary to the existing orthography. These workshops ensure engagement of the community in the development of their writing systems and ownership of the language. Now in the training and materials development phase of the program, SIL LEAD is guiding the preparation of teaching and learning materials for primary school classrooms. The process of developing materials includes first examining existing curricula in each language to assess what components can be utilized and what needs improvement. SIL LEAD consultants then design a tailored framework for teaching in the language of instruction. This comes with classroom materials and accompanying teachers' guides. Before implementation, teachers will be trained to teach using the new instructional materials. A support and feedback system for teachers will be established emphasizing peer-to-peer learning as well as adequate supervision. As per the established curriculum, children in class 4 will make a transition in the medium of instruction from the local language to English. They will then continue learning local language as a subject course. Teachers and school administrators will be trained in language-based learning methodologies and the use of transitional materials in order to help students smoothly transfer their learning into an English-speaking classroom. SIL LEAD will take part in this planning process and help ensure students and teachers are well prepared. 2014 is filled with lots of activity and planning in this cooperative effort to bring comprehensive education to Ugandan students.